The Halo franchise stands as one of the most lucrative and acclaimed media franchises in the world, having grossed well over $4 billion. After my interview with Microsoft’s Audio Director, Mike Cavaziel , I moved on to talk to Ken Kato, who is the Audio Manager for 343 Industries. He now handles senior duties at 343 and oversees audio work for Halo games. I talked with him about what his work entails, how the “Halo 4” soundtrack came about and what it takes to be a sound designer. Hi Ken! Can you tell me about your background and what drew you to the world of game audio? I graduated from college with a music degree and started working at Microsoft in 1995. I did audio work on my first game in ’95 too, such as recording, dialogue editing and music. Microsoft was doing a few PC game products at the time, and the big one was “Flight Simulator”. It was one of the first products that Microsoft acquired. So I did things like post-production for the trailers, airplane recordings and editing. I also did some RPG-like sounds for it that didn’t end up shipping. All of this was pre-Xbox days. I was still with Microsoft when the Xbox was in a very infant stage of development. Then I left the company for two and a half years, and the console launched while I was away. I came back to Microsoft around 2002, by which time the Xbox was in its second holiday cycle and already had quite a few titles. So I started on working on different AAA titles in the early 2000′s, like the Forza games. I’ve heard that you made one of the Window’s start-up sounds in the 90s. Is that true? Yeah (laughs). For Windows 98. That was my little claim to fame, which was a tough act to follow. How did you become involved with 343 Industries, and can you tell me about your current role at the company? Whils I was at Microsoft, 343 hired an audio director in 2009 by name Sotaro Tojima. He came from Konami, and had worked on “Metal Gear Solid 2“, “3“, and “4“. Because he was the only one doing all the audio work, he came to me to talk about assisting him on audio production at 343. For me, the process of going from the publishing side of the game industry to the development side was quite enjoyable. Back in the 90s, I used to be assigned to one title at a time, and my job was more about managing our sound designers; going over to 343 was a change back to that, which I welcomed. My title at 343 is “Audio Manager”. I basically manage all of the content creators and sound designers. We have sound designers for sandbox items like weapons and creatures. We also have voice-over specialists and two implementation specialists, as well as production assistants and an in-house composer. So I manage all of that, and help with production sometimes. I also help them with contracts; so if we happen to outsource something during post-production, I would help with the logistics of that. What does your daily work routine look like, and what would you say is the hardest part of your job? There is absolutely no daily routine. Every day looks different. There are a lot of conference calls and meetings that I do, in order to deal with our outsourcing and production needs, but sometimes I also have to help with in-house production as well, which could range from music production to voice-overs. So it’s a day by day process. Sometimes I have to fly to LA to supervise voice-over recording sessions. Other times, I might fly out to the UK for an orchestral recording at Abbey Road, or drive out into the dessert and record a bunch of guns and exploding sounds. So it’s not a routine, which is a part of my job that I love. What does 343′s audio department look like? We have a core team of people. I have one main sound designer for weapons, which is the main aspect of a first-person shooter. I also have a guy who specializes in voice-overs, and another that thinks about how to streamline the overall pipeline of our work, among other people. When our audio work starts to enter into the field of game programming, we hire a contractor for that, since that has more to do with data-wrangling. As long as we have a clear pipeline, a lot of our work is shampoo, rinse and repeat. Music is very scalable, because it’s an easy aspect of the game to outsource. All game companies do that, and a lot of musicians, composers, orchestrators and arrangers only work with a number of game companies, so they understand the process and the challenges, and that’s a big help for us. The same goes for video content like cinematics and cut-scenes. It’s basically like post-production for feature films at that point, so it’s also very scalable. What are some of the challenges that you face as an Audio Director? I think the main challenge for most game developers is the pipeline, by which I mean inter-dependencies among the different disciplines of the game-making process. Everyone has to co-ordinate very well to make things happen. A lot of the systems that trigger things like voice effects and music are fragile, so you have to be very vigilant. Whilst it’s possible to alleviate those challenges by creating automation tools, in order to minimize human errors, I try to have my staff do less data-wrangling and more content creation. Gamers don’t care about how well we manage our data. When someone goes to GameStop to buy “Halo 4“, they only care about what they experience whilst playing the game. How the sound designers manage to create the game audio isn’t as important to the gamer as what the sounds allows them to experience. So I try to have my team spend more time creating, rather than to wrangle data and stuff. What were some of the audio challenges in taking over the “Halo” franchise from Bungie, particularly since they already had a legacy of music for the game? I think Martin O’Donnell and his audio team did an awesome job of making people aware of audio as a key driving factor to the overall experience. Their ability to create such compelling content made the music into a part of the Halo brand. So following up on that in “Halo 4” was a daunting task for us. We had to figure out how to continue their legacy and respect that. There are a couple of orchestral pieces in the game, and “Never Forget” was one of them, which we used for the very last cinematic scenes. Also, through-out the game, there are a few typical Halo motifs that have an orchestral structure and arrangement which we were very conscientious about. But at the same time, because we have a new studio, and recruited very talented people from across the world, we wouldn’t have been satisfied by only using standard “Halo” music, even though that standard is very high. We wanted to create a sense of progression for users, since there is an expectation of us doing something new and different. So that was our biggest challenge for Halo’s music. 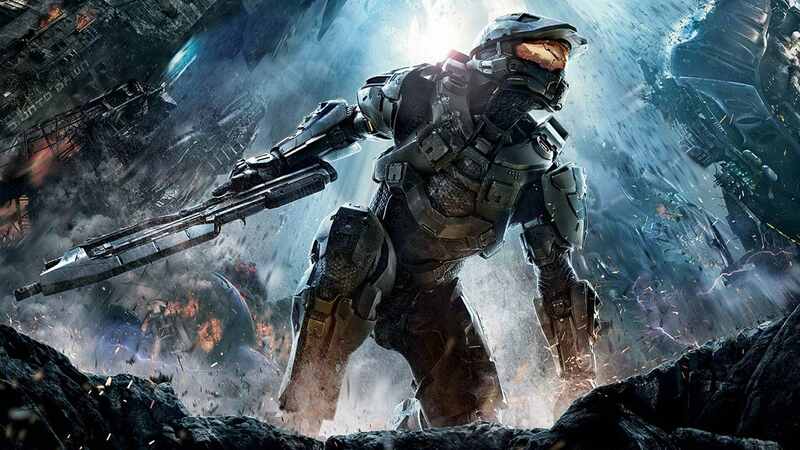 Can you talk about the process of working on the “Halo 4” soundtrack? And how did 343 get Neil Davidge on board? We’re very happy about the success that we’ve had with the “Halo 4”. We have a Limited Edition soundtrack box set which is kind of hard to find now, but I think you can get it on Amazon. It contains a behind-the-scenes documentary about how we worked with Neil Davidge from Massive Attack to create the soundtrack. Neil talks about how our in-house composer, Kazuma Jinnouchi, had to write some music for the game as well. He also talks about how me and the Sotaro Tojima approached 343′s management about bringing Neil on board, and how Neil came to 343 as a part of the pre-production process. He happened to be a huge “Halo” fan, and used to play it while working on albums with Massive Attack. He was very knowledgeable about the storyline and characters, so it was easy for him to respect the legacy that Marty had created with the music, whilst bringing his own sound to the table. Did Neil work closely with your team on making the soundtrack? He had his own production team, and would basically write out all of the pieces with MIDI, and that would then be translated into orchestral pieces. As is the case with any large-scale game production, you always need more people than just the composers. We had a larger team when it came time for the actual production, including an orchestrator and an arranger. Matt Dunkley scored the orchestration, who’s done a lot of work for Christopher Nolan’s films. We had copyists who printed out the score, and there was a lot of behind-the-scenes work which has a lot to do with the kind of data wrangling that I mentioned before. But since Neil’s team was very professional, it enabled us to be able to focus less on the data management and more on being creative and having Sotaro collaborate with Neil. How much input does your team have on the creation of audio and music for other Microsoft games? 343 is a fairly large studio, even by game industry standards, and we have a franchise team who help handle projects that are related to the overall “Halo” franchise, and not just in-house games. We have a great relationship with Paul Lipson, who is the Audio Director for all the titles. We definitely share our assets, like vehicle or weapons sounds, for use in our other “Halo” video games, like “Spartan Assault“. Even though my team works mainly on games, the 343 studio as a whole works on a lot of different things. For example, when we did the live-action feature ,”Forward Unto Dawn”, it was more of a collaboration and we worked with outside composers and shared our media assets. But the project itself was driven by different team within 343. I think it’s unique for a large AAA studio like 343 to produce the amount of content we do, which is so much more than what a regular game studio would. We do console games, tablet and phone games, webisodes, etc. We even announced during the last E3 conference that we’ll be collaborating with Steven Spielberg on future “Halo” media content. So we aim to have our work cover three screens: the computer screen, phone/tablet screen and the TV screen. My team wouldn’t be able to cover it all on their own. What’s the overall feedback been like for the soundtrack to “Halo 4”? That’s a hard question, because music is such a subjective thing, and people’s taste varies a lot. I would like to think that our music projects have been successful. We ranked really well on Billboard charts with the “Halo 4” soundtrack, and I think that’s a pretty good metric to compare with our competitors. The fact that Martin has been such a huge identity figure for the “Halo” franchise has been a very good thing, but also very challenging. However, it’s not so much about competition. Moving forward, I hope that people don’t try to draw competitive comparisons between our music and Marty’s. We just want to provide additional music to the Halo world, and if we don’t do that then we’re not doing our job. What kind of budget does Microsoft set aside for 343′s “Halo” soundtracks? Are they generous with that, given the extensive nature of “Halo” games? It’s a process. Any large organization, be it a game studio or investment bank has to look at creating entertainment projects that yield profit. So we have to balance the creative aspect with what are final sales are. A part of that involves minimizing the costs, and we’re always thinking of ways to spend our money wisely. We don’t just go to Abbey Road Studios for the sake of it. We definitely go through a budgeting process to give our management enough data to make sound business decisions, but at the same time, we’re trying to be smart about how much we spend. Just because you spend money doesn’t mean you get great results. Learning that comes with experience and making mistakes. So after a lot of years in this business, I know what works and what doesn’t. Whilst working on “Halo 4”, what were some of the constraints your team faced? I think our biggest constraint was scheduling and time; our schedules were very aggressive. I’m happy that we were able to deliver everything on time, but we were prevented from doing some things due to time constraints. But that’s how it is with any audio development. We’re the team that’s at the end of the pipeline. It’s not possible for us to attach our sounds to a vehicle unless that vehicle is already running in the game. In order for us to contextualize the gaming experience, we need other teams to bring the content to a certain level. So if they’re late, it directly affects our ability to do certain things, since the shipping date for a game title isn’t always changeable. So as things get delayed upstream, our schedule just gets more compressed. We have to be pragmatic about what to keep and what to cut. One thing we tried to do was bring better sounding in-game reverb, but we ran out of time. Of course, the reverb doesn’t sound bad at all, but we’d like to do something better the next time around. Does 343 have any intentions to license any music for future “Halo” games, or will you guys stick to having scores created by contracted composers? We did do an extra album of remixes for the soundtrack, which is one way to bring different perspectives into our music content. It was a fun thing to do. When they were being sent in, it was really exciting to see how those people interpreted the in-game music. As far as licensing other people’s music, it really depends. It goes back to what I said about Marty’s music versus our music. We don’t want it to be that way; we want it to be “Halo’s” music. So if we came across some music that worked really well with the game, I don’t think we would say “no” to making it work. But we’ve never run into that situation. Can you talk about the main criteria for bringing on new sound designers to your team at 343? First and foremost, I don’t look much at their past work or resume; I don’t really care about that. I hired our lead sound designer right out of school, and he had never shipped a game. He worked with me at Microsoft’s Sound Lab before we moved to 343. The decision that led to me hiring him was his strong demo reel, which is the first thing I typically look at. Also, it helps to have visuals that accompany your demo reel. My favorite kind of resume is game footage that has the sound effects and other audio replaced with your own material. It’s easy to get footage from Youtube of popular games and replace the audio. Voice-over work isn’t really something I look at. We record real actors in LA for our dialogue scenes anyway. Sending me music isn’t helpful either, because our sound designers don’t do that, and we outsource the music-making to composers. Some people send me music demos, and I’m like “Uhh, I can’t really do anything with this….”. But doing sound effects replacement for game footage is the best way to make me want to talk to someone who’s looking for a job. Following that, I would want the person to talk about their creative process. I might say, “We want to create this alien-like weapon sound. Tell me about the questions you would ask if you were asked to make a new sound for the Covenant Needler gun“. I wouldn’t be that interested in what plugins they’d use or things like that. I’d want to know how they come up with creative decisions, based on the context of our discussion. So knowing their intention is very important to me. A demo reel is the evidence of that intention, and then figuring out how they work is what I would do. With regards to actual music production, I just expect people to know how to use Pro Tools. I assume anyone who’s applying for a job is capable from a production point of view. If you don’t have that, then you’re just wasting my time. I could care less if an applicant has worked on other big budget AAA titles in the past; that kind of thing doesn’t matter very much. It’s kind of like hiring the same voice-over actor from other popular titles. Whilst there are some successful VO actors that make appearances in a lot of titles, it has the downside of having many games sound similar. As I said before about music, we want to bring something new to our games, so that kind of mindset applies to sound effects as well. Sometimes bringing in someone who’s right out of school is the better move, as he may have access to some tools or process that industry veterans don’t even think about. I know a lot of people get frustrated about having no experience, and they say “I need a job to get experience, but no-one will give me a job without experience“. But one thing I tell people is that they can break that cycle by becoming an intern. I know it’s crappy, and you end up with jobs that no-one else likes to do, but it’s a good way to break into this industry. I can give you an example: one of our voice-over specialists had an interview with me some years ago to work on my staff, but I told him that he didn’t have a lot of experience in the game industry, and suggested that he should do an internship, which he did. He interned at some studios, worked for free, and did a good job. By the way, if you’re good, your internship will turn into a paying job (if it doesn’t, you might want to re-examine your career choice). In his case, he got a job at a small studio and worked his way up. Four years after I had suggested he get an internship, he came to work at 343 on “Halo” games. So if you’re frustrated with your lack of experience, go do an internship, work for free, and work on your demos. You don’t need a job to work on demos. All you need is Pro Tools, which you can get for as little as $300 these days. On a concluding note, can you offer a last piece of advice for anyone who’s looking to gain more experience in the game music world? For me, I define experience as making mistakes without getting fired. You need to know how to avoid making the really blatant mistake that would get you fired, whilst still making small mistakes that you’re always trying learn from. If you do this long enough, you’ll be able to get involved in various aspects of game audio production like music, sound effects, marketing, promotion, working on contracts, etc. By knowing what not do in those areas, people will start to appreciate your perspective, because you will have made those mistakes already. That sort of experience will naturally translate into leadership roles. You can’t help people who haven’t yet made the necessary mistakes to get that experience. So make mistakes, but don’t get fired.